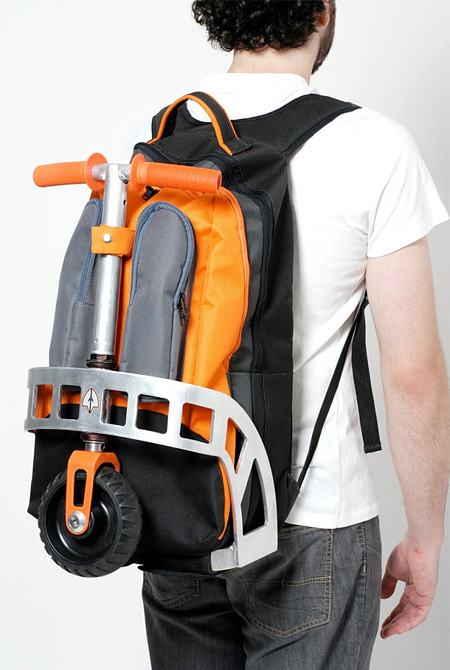 Here’s a scooter that’s designed to fold into a backpack. It seems odd at first blush – a scooter you can wear on your back while riding a … ? Actually it’s designed for commuters who want to mix scooting with public transportation, or who want to unobtrusively carry their rides into their hoity-toity offices. Maybe a celestial terrestrial commuter? The Mayor of London has announced nearly £1 billion of spending intended to overhaul London’s cycle routes. The plan includes the creation of a 15-mile (24-km) “Crossrail for the bike,” substantially segregated from road traffic, connecting the suburbs of East and West London. When I lived on Manhattan (the ‘seventies and ‘eighties) there were bicycle lanes (aka boondoggles) on some of the avenues; they were separated from the street by double-sided curbstones. They promptly filled up with pedestrians hailing taxicabs and hot-dog carts, and the curbstones effectively trapped cyclists encountering same. Luckily footbikes can use sidewalks in most areas – is London among them? FLUX, the first waterproof backpack with LED lighting, is constructed of a durable 1000 Denier Cordura Nylon exterior and a Tarpaulin vinyl coated polyester lining. FLUX offers you a clean, subtle design during the day coupled with LED powered lighting for maximum visibility at night. …and I do mean buy: It’s currently marked down to $120 … from $180. 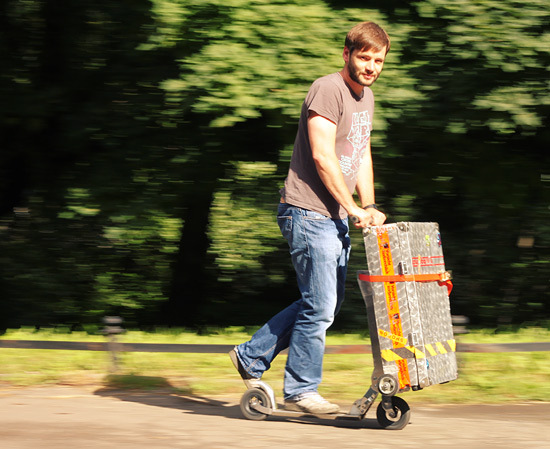 Dave Riley has documented his Mibo experience: Uncrating it, getting to know its quirks, and comparing it to his Kickbike. At 8 kgm it isn’t especially light but that’s not the primary issue in way of cartage. Unfortunately, the Mibo isn’t a balanced carry and after a distance discomfort can set in. Outside, out and about, the scooter is better riden rather than carried but when folded and ‘ported’ between scoots I find that it is preferable to bag the scooter rather than let it travel naked. Niklas Roy showed the right impulse given the hardware he had at hand: a Razor™-type scooter and a battered travel case. He cobbled together this populist take on this recent Kickboard USA ride. 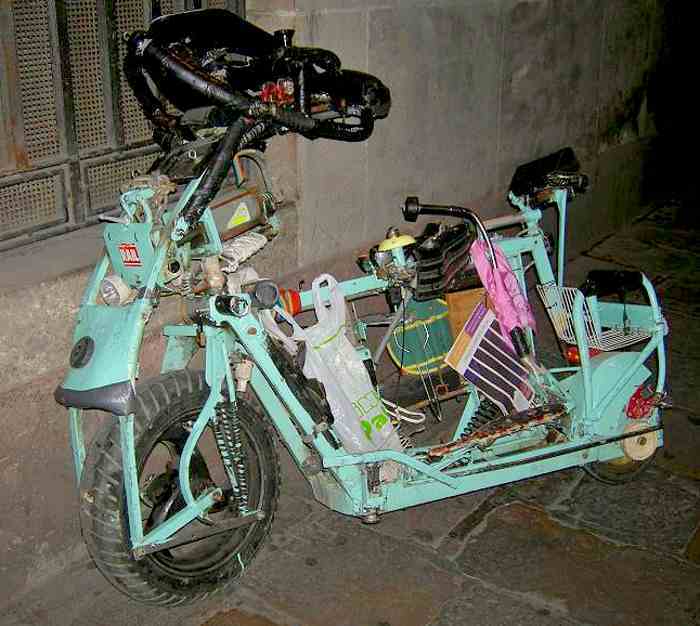 Of course, I say it’s better because its two wheels trump the Micro Luggage’s three, stability-wise.